A new study by LMU researchers led by Christian Weber sheds light on the role of the adhesion molecule JAM-A in the recruitment of immune cells to the inner layer of arteries – which promotes the development of atherosclerosis. 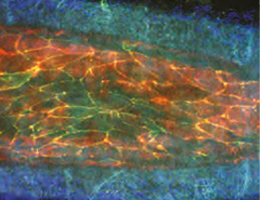 Multiphoton microscopy makes it possible to image the vessel wall (blue: collagen) and inner lining of an artery that has been subjected to atherosclerosis-promoting conditions. Staining for endothelial cells (red) and JAM-A (green) reveals the localization of JAM-A at the cell junctions and the first signs of its redistribution to the cell surface. Areas of overlap with the endothelial cell marker gives rise to the intense yellow signal. Atherosclerosis is characterized by the formation of fatty “plaques” on the inner lining of the arteries, and is facilitated by high levels of fat in the diet. These “plaques” constrict the vessel, restrict the flow of blood, and may precipitate strokes and heart attacks. Monocytes, which belong to the immune system and help to defend the body against pathogens, also play a central role in the development of atherosclerotic lesions. In regions of the vasculature where the normal pattern of blood flow is disturbed, monocytes can penetrate the vessel wall and release signal molecules into the underlying tissue, which attract other immune cells to the site. The resulting inflammatory reaction then leads to the build-up of plaques. Professor Christian Weber of the Institute for Prophylaxis and Epidemiology of Cardiovascular Diseases at LMU studies the molecular processes that facilitate the migration of these cells between the cells of the vessel wall. In the latest issue of the journal Circulation, he and his team report the results of an investigation carried out in collaboration with colleagues based at Maastricht University, which was designed to elucidate the role of an adhesion molecule called JAM-A in the development of atherosclerosis. JAM-A is of interest because it is expressed both in the blood-vessel wall and in white blood cells, including monocytes. The protein harbours a variety of binding sites, and can interact with itself and several other binding partners. The acronym stands for “Junctional Adhesion Molecule-A”, and refers to its primary function in mediating cell-cell contacts. In essence, it serves as a molecular zipper between cells. In the new study, Weber and his colleagues have looked at the effects of the targeted reduction of JAM-A levels in specific cell types. The walls of veins and arteries are made up of a monolayer of so-called endothelial cells, which are held together by cell-cell junctions that include JAM-A. At sites, where laminar blood flow is perturbed, JAM-A is redistributed away from the intercellular junctions to the cell surface. This promotes attachment of monocytes and allows them to migrate between the endothelial cells into the tissues. Weber and his team have now shown that, when the levels of JAM-A in endothelial cells are reduced, fewer monocytes get through, and fewer lesions are formed. This might suggest that pharmacological blockade of JAM-A could reduce the incidence of atherosclerotic lesions, but there is a catch. For when the molecule is deleted from monocytes, the cells get trapped as they migrate through the endothelial cell layer. This results in local damage to the vessel wall, and enhances the formation of plaques.